The Yearbook for Traditional Music is a refereed scholarly journal which carries essays, reviews, and reports in the area of traditional music and dance research. 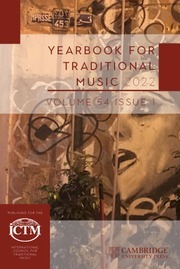 The Yearbook was established in 1949 as the Journal of the International Folk Music Council, and it is published in English every November by the ICTM Secretariat. All ICTM members and institutional subscribers in good standing receive a copy of the Yearbook via air mail. The latest issue of the Yearbook is Vol. 50 (2018), which was published and distributed in November 2018. Vol. 51 of the Yearbook for Traditional Music will be published by Cambridge University Press.